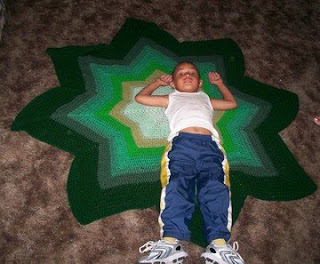 For us ladies to lay back grab a hook and get crocheting. Show what you have been working on. For beginners and for those pros out there. 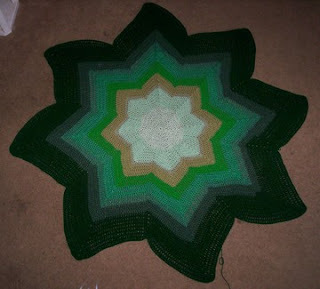 From crochetalong to swaps and more:) jump in and grab that hook. I Have started a swapping blog: So if you like to take the time out and check it out hoping to get some more people to join in on the swaps. 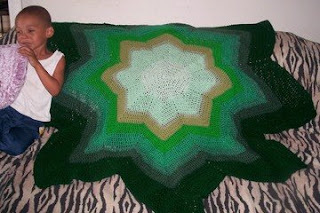 Okay here is the blanket I made my godson for his b-day which is the same day as mine. It is made with scrap greeens. It is 61 inches from point to point and I used a J hook. 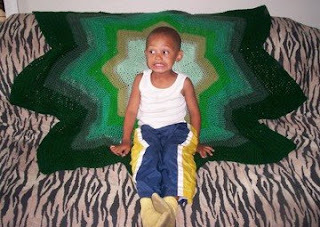 Here he is sitting next to his blanket to kind of show the size. This one he is making a silly face at his mom. As you can see he is sitting on one of the points that just how big it is. Here he is laying on it to show size again. 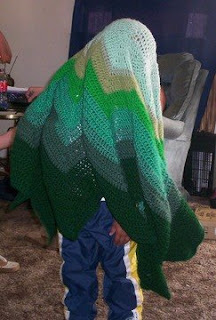 And finally he wanted to be a green ghost lol. Oh and he turned 4 on our birthday this year.